As I sit here and think about what to write for The Llama Park’s first blog post, it occurs to me that perhaps the best place to start is at the beginning. To truly understand The Llama Park, maybe it is best to understand me and my family. My name is Lily Schuck and I am 23 years old, the daughter of two of the most incredible people in the world. 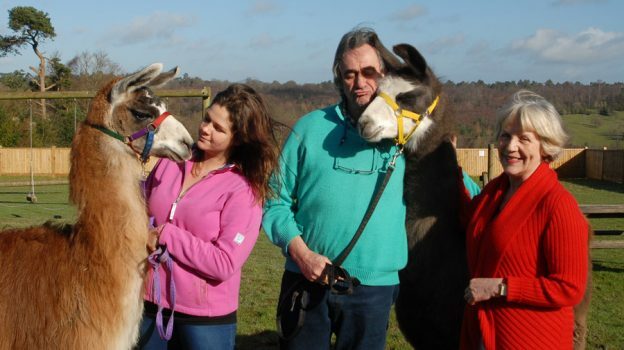 Our journey in becoming owners of The Llama Park has been consistently told from the perspective of those two wonderful people and so, I felt it was time for a different angle. My mother is one of five daughters, born to a Navy captain. She grew up with a pure and unconditional love for horses, a love that I believe she transferred over to me. A love that I believe has made her sensitive, strong and considerate. She was, growing up, a total wild card, the naughty one of the sisters and she grew up in London in the sixties and seventies. I can say, without any doubt, that she is one of the strongest women I could ever hope to meet. She became an editor on Fleet Street without ever having attended university and her incredible eloquence and way with words has been a consistent presence in my life, right up to a month ago when she proof read my final draft of my university dissertation. When my mother was 23 years old, she was set up on a blind date with my father. She went home. He was the son of a Czech refugee who had been evacuated from Prague and met my grandmother in the Cadbury’s factory in Birmingham after the war. My grandfather later joined the RAF as a navigator which ignited my father’s wanderlust, with the family being stationed all over the world from Singapore to Kenya. By the time my father was in his 20s, he had moved to London and started his own roaring lifestyle, encapsulating the fearless entrepreneur in every way with businesses from catamaran construction to jazz speakeasies in West-London. On the scene, in London, they met. I never fully asked why my mother went home from that first blind date but needless to say they passed each other in the ‘scene’ countless times, becoming part of the same network. My father went on to marry and have a son, my beautiful brother Max. Through circumstance and mutual connections, my parents did become friends. Eventually, this grew to more than just friendship and, when my mother was 39 years old, she had me. This background may seem strange as the beginning to a Llama Park blog but for me, The Llama Park is what IT is because of who THEY are. I have been fortunate enough to grow up in Dubai, Spain and Australia and even spent some of the first months of my life living on a Norwegian fishing trawler in Cyprus. They have always been an incredible ying to the other’s yang. My father creates dreams and ideas in his head that I can only fully comprehend when they have materialised in front of me. My mother has always been more cautious – brave but also fully aware of my father’s capacity to get carried away sometimes. Three years ago, I was in my second year at the University of Leeds. My father was over 60, my mother just approaching it. They had returned to the UK one year previously to be closer to family and to escape the increasingly shiny bubble of commercial fluff that Dubai was becoming. One day, I was being a stereotypical student, stewing on the sofa with friends after a night out when my father called me. He explained that my mother had found a Llama Park for sale – 33 acres of land in Sussex with about 50 llamas, 20 alpacas and a herd of reindeer with a small coffee shop and alpaca knitwear gift shop. They never were the types to retire I suppose. They had considered endless ‘projects’, from doing up a ruin of a house or even starting a chippy. In this little gem, however, they saw the potential they were looking for. The purpose of me providing you with background about my parents should be increasingly evident. I don’t think I was even particularly phased or surprised when they suggested this plan. Maybe it was because I never thought it would materialise or maybe because I hadn’t seen it, I didn’t understand the full gravitas of what they were planning to take on. They had always told me that retirement would kill them. As a 23 year old, they have more energy, drive and determination than I could ever hope to muster. I think in retrospect that I perhaps didn’t question this decision because I trust them so much. Sure, they make mistakes but I trust them to take everything in their stride and to consistently strive to make my life better. On the 13th May, 2013, my mother turned 60 and on the same day, final contracts were exchanged. So began the journey that I want to share with you. In the last three years, countless changes have taken place. My father has completely transformed the infrastructure of the place and it is absolutely unbelievable. Some of our journey, I want to share. We are first and foremost a family. On some days, we wake up, look outside and cannot believe our luck, living this life, in this beautiful place. On other days, we argue, fight and worry about the future, our staff, our animals, our profits. But I hope that this blog will provide readers with some of the raw, honest and wonderful goings-on behind this weird and wonderful place. This entry was posted in Blog on 30 June 2016 by llama.